Last New Year’s Eve, as my wife and I put together our Annual Report, I had a revelation. And it’s one that can help you – organizationally… and financially. And they’re becoming very popular in the Singularity Era. That’s because with these platforms tech execs save money, run their business more efficiently… and rake in the profits. In fact, there are three “Singularity Era Tools” that you can use every day to improve your skill set, find winning stocks, know when to cut your losses – and enjoy peace of mind. With these three free tools, you can build your picker’s “muscles” – improving your odds of crushing the market, not just this year but for many years to come. We’ve been talking a lot about artificial intelligence (AI) over the past few weeks. About how the big brains at Google’s DeepMind AI system say they may have developed a memory system they’re calling a “differentiable neural computer” (DNC) and possibly unlocked the path to truly intelligent deep learning. About how many of Facebook Messenger’s 1 billion users are using AI-enhanced “chatbots” for their customer-service needs – chatbots that may soon be handling bill paying, shopping, delivery, and a range of other tasks. As we approach Christmas and the end of the year, I’m getting ready for one of my favorite nights. You see, I love New Year’s Eve. In fact, I don’t party at all. Instead, my wife and I have established a neat little ritual that lets us say adios to the outgoing year and to welcome in the new one by setting some goals for the one that’s coming in. We dress up and go out for a late dinner – usually at one of the nice local eateries that we like and support. But before we do, the two of us always sit by the fire and have our most important “family talk” of the year. Each year, you see, I write an “Annual Report” that details our achievements for that year. These include accomplishments at work and in the civic projects we’re involved with, great investments we’ve made, and projects we’ve completed. As my wife and I sit by the fire, we review that “report” – and celebrate our accomplishments. And then we establish goals for the New Year – creating an “Investment Action Plan” whose success or failure we’ll review at our “chat” the following New Year’s Eve. I’m sharing this story for a reason: My wife and I have been doing this for more than a decade now. That’s long enough to see that this “tradition” has had a positive impact on our lives. I’m talking about developing an Investment Action Plan. We’ve all seen the “Trump Tweet Effect” these past weeks, as the president-elect’s unfiltered Twitter messages hit some of Wall Street’s favorite stocks. 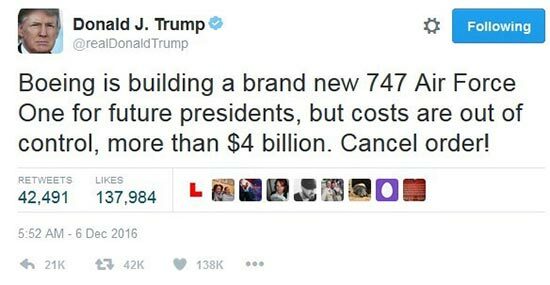 Donald Trump took The Boeing Co. (NYSE: BA) to task early on Dec. 6, for its overly lavish federal contract. The company’s stock opened 1.54% lower in a move that wiped more than $1 billion in capitalization from the books. Later that same day, Trump reported that SoftBank Group Corp. CEO Masayoshi Son, a Japanese billionaire and technology investor, had agreed to invest $50 billion in the United States, aiming to create 50,000 jobs. And he took credit for the “deal.” Since, then Softbank, has soared nearly 15%. Then on Dec. 12, Lockheed Martin Corp. (NYSE: LMT), one of our best defense plays, lost $4 billion in value in the aftermath of Donald Trump’s tweets about the F-35 Lightning program. Now, these losses and gains say more about Wall Street traders than about Trump – or the companies he’s talking about. But we need to watch out for this kind of “volatility” from here on out. Unless… you go with the recommendation I’m going to show you now. It’s offering explosive growth in a blue-chip package – 37% gains year to date. Consider a trip from Times Square to Wall Street. If you’re at all familiar with the New York City Subway, you know that’s an easy route – no train changes required. Now, consider a trek from the Bronx Zoo to Flushing Meadows in Queens, where they play the U.S. Open. If you can figure that out, you’re smarter than most advanced artificial intelligence systems. According to researchers at Google’s DeepMind AI project, such systems can perform pretty simple tasks like picking out the best Times Square-to-Wall Street route 98.8% of the time. But when it comes to more complex trips, they have a success rate of just 37%. But now, DeepMind’s big brains say they may have solved that problem with a memory system they’re calling a “differentiable neural computer” (DNC). By doing that, they may have found the key that unlocks the path to truly intelligent AI and deep learning. Today, we’ll take a look at what DNC is. And we’ll dig up a company that’s making memory breakthroughs like it possible. This stock is 40% off its two-year closing high. It’s going to get back there and higher pretty quickly – and make a nice 25% in just the next year. I’ve done some of that myself. But maybe we should rethink that a little. Trump has said he plans to act more like a chairman of the board, while Vice President-elect Mike Pence and the Cabinet handle the nitty-gritty of government. After all, Trump’s pick for Secretary of Transportation will head up much of the president-elect’s $1 trillion infrastructure improvement plan. But more importantly to our interests here, she’ll be in charge of regulating self-driving vehicle technology. If Chao’s history as Deputy Secretary of Transportation under George H.W. Bush and Secretary of Labor under George W. Bush repeats itself, that’s good use, because she’s known for a light regulatory hand. To us, that means public companies in the self-driving space are likely to see a big boost in share price over the next four years. Especially the one we’re looking at today. You can already find its “pre”-autonomous driving technology in many of the most prestigious nameplates. Its technology is the force behind two of the most “public” driverless car tests over the past couple of years. And its shares are primed to soar as much as 40% in the next year alone. There’s a tech “play” out there that gives us access to just about everything: solar panels, data storage devices, tablets, smartphones, cars and trucks, and even high-definition TV sets. It also puts us in antibiotics… water purification systems… and even NASA spacecraft. And I bet that most of you have a piece of this “Universal Tech Play” on you as we speak. Most investors think of it as a precious metal – a way to store value. But you’re not “most investors,” and you now know that silver – this Miracle Material – has a special set of properties you won’t find in other commodities. It’s an excellent electrical and thermal conductor; it provides a durable and smooth coating for many tech components that can’t have imperfections; and it has anti-microbial properties that help medical devices stay germ-free. Washing machines, refrigerators, air conditioners, air purifiers, and vacuum cleaners all rely on silver nanoparticles to sterilize up to 650 types of bacteria. And right now, another hot growth area is just starting to develop for silver – nanotechnology. Engineers have begun tinkering with this metal, looking for ways to apply wafer-thin layers of silver to a range of industrial and medical products. While silver prices have been weighed down by strong economic figures lately, this shouldn’t deter you long term. In fact, the best time to find great bargains in silver is before another price surge. Rats have long been one of humanity’s worst enemies. Flea-invested rats were carriers of the bubonic plague that killed between 75 million and 200 million Europeans in the mid-14th century. Today, rats still carry and spread many diseases – some fatal – including hantavirus pulmonary syndrome, murine typhus, and rat-bite fever. But I love rats – specifically, OmniRats. These rodents – developed by biotech researchers – contain disease-fighting antibodies that are remarkably similar to the ones found in us humans. And those researchers believe they’ll be the key to dozens of successful drugs. This is the type of biotech breakthrough that defines “How We Thrive” in the Singularity Era. To the healthcare community, that means these rats have the potential to save millions of lives. To the company behind these rats, they mean new clients, more revenue, and bigger profits. To tech investors like you, that could mean 50% gains in the next 12 months alone. When it comes to mining – of both precious and strategic metals – most of the “low-hanging fruit” has been both discovered and mined out. That’s even with the sophisticated power, equipment, and transportation technologies we discuss every week here. One of the biggest tech advancements in recent years, however, has made those lower grade deposits – i.e., lower metal concentration per ton of rock – economic to mine. I’m talking about the ability to move, crush, and process massive amounts of rock from open-pit deposits. However, as we all learned in school, oceans cover 71% of Earth’s surface. But we’re closer than you might think to mining for metals – many of them absolutely necessary for the tech devices that are fueling the Singularity Era – from the ocean floor.